DHA Valley Islamabad is a housing project by the Defence Housing Authority (DHA), Islamabad-Rawalpindi. DHA Valley is located next to DHA Islamabad-Rawalpindi Phase II Extension on Islamabad Highway. 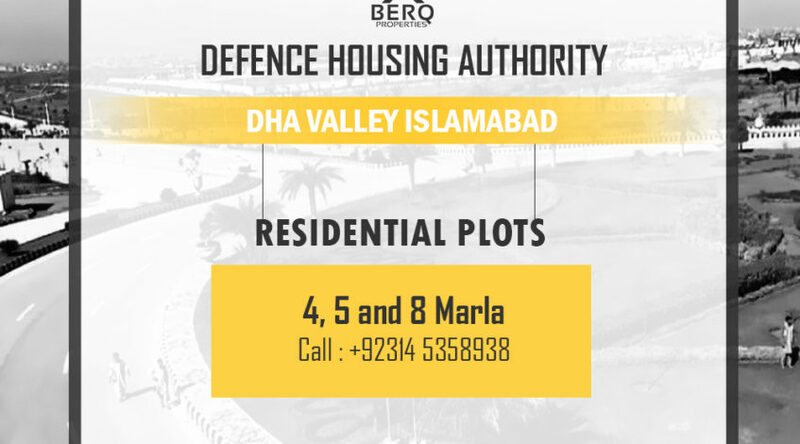 DHA Valley offers 5 marla (125 square yards) and 8 marla (200 square yards) residential plots for 650,000 Pakistani rupee and PKR 880,000 respectively, with a quarterly installment plan for Pakistani residents. DHA Valley Overseas offers 5 marla (125 square yards) and 8 marla (200 square yards) residential plots for $US 9,500 and $12,900 respectively, with a quarterly installment plan exclusive for overseas Pakistani residents. DHA Homes offers 5 marla (125 square yards) and 8 marla (200 square yards) residential plots with houses for PKR 2,299,000 and PKR 4,199,000 respectively, with a quarterly installment plan for overseas and Pakistani residents. DHA Commercial Avenue offers 4 Marla (100 Square Yards) and 8 Marla (200 Square Yards) commercial plots for PKR 2,000,000 and PKR 4,000,000 respectively, with a quarterly installment plan for Pakistani residents.